This week Luke and Devin start covering the Jeff Parker run on Exiles and a podcast beef. Podcast beef and an excellent comic? Go for it! 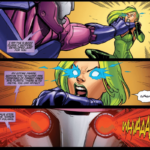 On Earth-8149 Polaris, Lorna Dane, is destroying a group of sentinels but one with a carbon fiber body sneaks up and shoots her with it’s eye blasts. 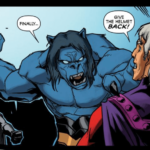 On Earth-763 the Avengers including Beast, Hank McCoy, and Wonder Man are fighting MODOK. Beast charges at MODOK when Wonder Man gets injured and ruptures his fuel cell, detonating it. On Earth-1119, Black Panther and his robot lion L-10 explore a lost temple only to be taken by surprise by Klaw who cuts through L-10 with a sonic blast that impacts Black Panther as well. On Earth-2814, Storm and Forge fight back against a Skrull invasion with a massive attack city built out of Sentinel City. 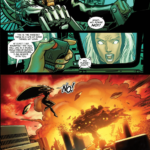 Storm calls for Forge to eject so the Sentinel City can self destruct taking out the Skrulls, but he reveals he has to do it manually and Storm watches in horror as the city explodes. On Earth-8823, Dr Strange and Wong are trying to get into a room where Scarlet Witch, Wanda Maximoff, is trying to resurrect her brother Quicksilver from the dead but the Mists of Ectus that she tries to wield turn on her, killing her. 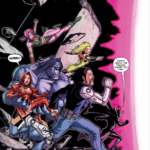 And then Wanda, Polaris, Beast, Blink, Black Panther and Forge wake up in a field, confused. 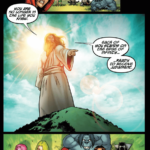 And then Moses appears declaring them to prepare for judgement – except it’s Morph – but not the physical one as Beast finds out when he tries to attack. It is a subconscious delivery and he goes through the spiel with some difficulty. They were pulled out a second away from Oblivion and they can’t put them back in without messing with reality and the more earths that are messed with, the more fragile reality is. So he needs help fixing them or they can go home and be dead. Morph is now also a Timebroker and so they have work to do and he warns that they will see some weird stuff like the Hitler baby dilemma or the Ghandi baby dilemma in Forge’s case. 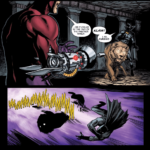 That’s when the Tallus comes onto Blink’s hand – with a blink sound effect, and it will give details when needed. Then they get pulled out and dropped into a new world where everyone except for Blink as they start to recover and explore. The mission from the Tallus is they are supposed to help Wolverine overthrow Magneto and they’re in Genosha on Earth-90631. One of the things I love about Parker is the small details in dialogue and the voices. 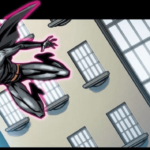 Blink decides they all go over their powers – Blink can teleport and use displacement javelins. Lorna Dane has magnetic field control and Scarlet Witch explains the two of them are Magneto’s daughters and that she essentially has Magic powers. 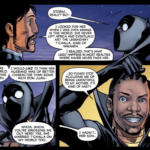 And Black Panther is getting impatient so he explains Forge can build anything, Beast is a Dr and he’s bigger than normal and Black Panther is the only non-mutant. They get closer to the city and find out that Wolverine is very dead – like decapitated and keelhauled dead. Blink tries to get the mission going and Forge pulls her back and wants them to elect a team leader and they get into a discussion and everyone ends up accepting Blink as the leader. A nuclear missile is sent in and Sauron is able to peel back the organic anti-metal coating but Magneto has to destroy it, consuming him, and we see this world’s Wanda and Polaris begin bickering over how they also helped the situation. Unfortunately someone points out Forge is in the crowd and Maggott the cop tries to arrest them until he notices Wanda and Lorna while Beast takes they guy who ratted them out into an alley and then they all go to the guard station so Forge can get into the world’s history. Here Xavier and Magneto remained friends and were able to work towards coexistence so the Hellfire Club mutants and the Brotherhood worked together but in doing so only handled non mutant threats which made them less accepted overall which led to the Sentinels being better funded so they killed Xavier. 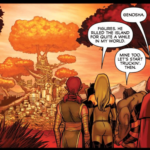 This led to a war between the heroes until the United Nations allowed mutants to move to Genosha – but the rest of the world tried to bomb them and Magneto reversed it so the world is at war currently. Magneto actually raised his daughters in this world with Moira MacTaggert who remarried after Xavier died but Lorna and Wanda dislike one another. They were unable to get more information and when Wanda wonders if Beast could do it he turns it down. They decide to swap out the Exiles Wanda and Lorna for the ones from this reality. 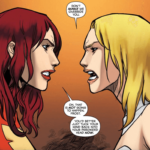 Royal Wanda uses the Phoenix to see how Lorna was going to dress for the big party because Lorna wanted to embarrass her, though weirdly the Exiles comment the Phoenix Force didn’t manifest – but that may just be she never got replaced. They teleport in and knock her out. Meanwhile Magneto talks to Lorna to try and get her to behave with her sister and they bring up how Pietro was supposed to rule but he was killed. 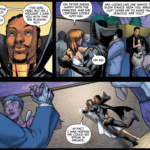 And that’s when Black Panther shows up tries to hit on her and they are just not well prepared for a magnetic person especially when Forge goes and instantly punches himself in the face. Luckily the Exiles Lorna shows up and is able to overpower the Royal Lorna. 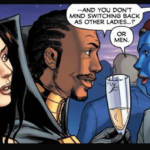 Panther is still hitting on everyone and doesn’t understand why Forge is angry about that and Forge wants to get back to his wife, Ororo, who on this world married T’Challa, and which happened on the world of the Exiles Black Panther. He’s a 19 year old T’chaka, prince of Wakanda. 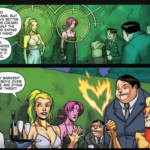 During the party Beast and Forge to recon, while T’chaka and Wanda go to one side of the party and meet Rogue and Jean Grey and Blink and Lorna Dane end up talking to the Brotherhood mutants Blob, Toad, and Pyro. Unfortunately during the recon, Rogue and Nightcrawler sap Forge and Beast. Wanda and Piotr dance, T’chaka hits on Mystique, so Kitty steals Tchaka to get back at Piotr and the phases him out of the party. 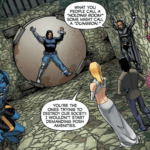 The original five X-men show up and Ice Man is able freeze the Brotherhood to get Lorna and Blink, taking them by surprise. 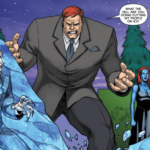 The Juggernaut gets angry which brings more attention over and Jean Grey and Emma Frost get in an argument which brings over Magneto who is very angry. Jean rats them out as being from another dimension, hoping to overthrow Magneto, and so they all end up the dungeon where they can’t really escape. 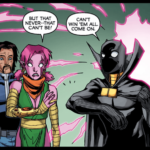 Blink is unable to teleport herself – so Forge understanding the mechanics of the machines, has her teleport Panther out and we overhear that Frost likes Magneto and Moira is jealous. 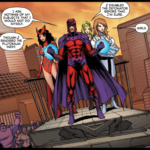 Panther reaches Wanda and Lorna, meanwhile Jean and Emma talk about their concerns over Magneto but the Exiles escaping briefly interrupts things. Beast destroys Magneto’s helmet and they ask Jean and Emma to reveal the truth – Magneto fell in love with Moira and let him die which allowed him to unite the X-men. 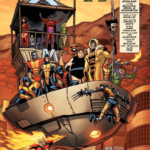 With the truth revealed, Jean knocks Magneto out, Cyclops suggests making a council of mutants to adjudicate and Blink gets a message to abort the mission which surprises Blink. The team escapes and in a really cool moment as they run through the portal that opened for them the art changes and they land in the desert. 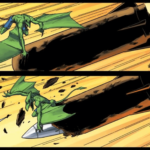 Blink points out that Earth is still on the course for destruction and when Forge offers another solution she tries to hide that she knows more. 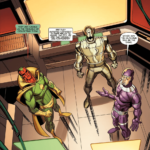 As they walk through the desert they find a city and a robotic lizard watches them and reports their findings to Vision, Machine Man and Ultron. The final art was by Casey Jones on Pencils and Karl Kesel on Inks. 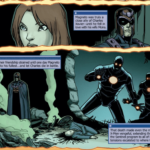 This entry was posted in Exiles, Podcast and tagged exiles, jeff parker, salva espin by The Watcher. Bookmark the permalink.